This book makes an illuminating contribution to one of Christianity's central problems: the understanding and interpretation of scripture, and more specifically, the relationship between the Old Testament and the New. John David Dawson analyzes the practice and theory of "figural" reading in the Christian tradition of Biblical interpretation by looking at writings of Jewish and Christian thinkers, both ancient and modern, who have reflected on that form of traditional Christian Biblical interpretation. Dawson argues Christian interpretation of Hebrew scripture originally was, and should be, aimed at not reducing the Jewish meaning or replacing it but rather at building on it or carrying on from it. Dawson closely examines the work of three prominent twentieth-century thinkers who have offered influential variants of figural reading: Biblical scholar Daniel Boyarin, philologist and literary historian Erich Auerbach, and Christian theologianHans Frei. Contrasting the interpretive programs of these modern thinkers to that of Origen of Alexandria, Dawson proposes that Origen exemplifies a kind of Christian reading that can respect Christianity's link to Judaism while also respecting the independent religious identity of Jews. Through a fresh study of Origen's allegorical interpretation, this book challenges the common charge that Christian non-literal reading of scripture necessarily undermines the literal meaning of the text. This highly interdisciplinary work will advance debates about different methods of interpretation and about different types of textual meaning that are relevant for many disciplines, including ancient Christianity, Jewish and Christian thought, literary theory, religious studies, and classical studies. John David Dawson is Professor of Religion and Comparative Literature and Constance and Robert MacCrate Professor in Social Responsibility at Haverford College. He is author of Literary Theory (1995), in the Guides to Theological Inquiry series and Allegorical Readers and Cultural Revision in Ancient Alexandria (California, 1992). "David Dawson’s Christian Figural Reading is an elegant, deeply important and wonderfully complex book. Interweaving themes from early Christian scholarship, literary theory, and contemporary Christian thought, the text offers a challenge to scholars across a number of currently contested and fast-moving fields, demanding of us all that we rethink Biblical interpretation as ‘the principal site of the tension between past and future.’ The hero of the book is Origen: Dawson shows how the continual transformation of identity in the light of constant attention to the mysterious ‘performance’ of the divine in history is at the center of Origen’s method. 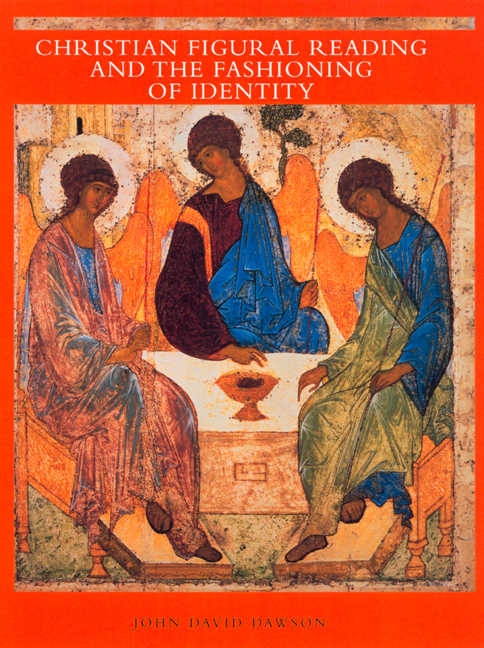 In the book’s key twist Dawson argues that this Origenist process of figural reading can serve to reshape Christiansí understanding of their own engagement with Israel. Here Origen the promoter of fanciful and supercessionist Christian reading becomes the resource, beyond even Boyarin, Auerbach and Frei, for rethinking this most dangerous of intercultural engagements. Early Christian scholars, theologians, literary theorists, all will need to attend to Dawson’s argument. "—Lewis Ayres, Candler School of Theology, Emory University.